Maryland got off to a sloppy start Monday in their Ludwig Field opener against No. 17 West Virginia, trailing 1-0 in just the seventh minute. Like their explosive second-half Friday against St. John’s though, the Terps offense came alive in the second half against West Virginia despite trailing 1-0 at halftime. 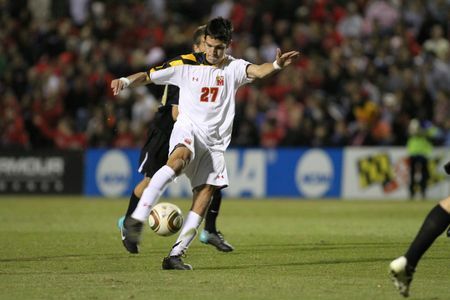 John Stertzer got the rally started with a penalty kick goal in the 54th minute and headed in another for Maryland to take the lead just seven minutes later. Eight minutes after that, a crisp passing attack that brought the ball across the field from Alex Shinsky to Casey Townsend to Widner Saint-Cyr and then finally to Jereme Raley put the icing on the cake. 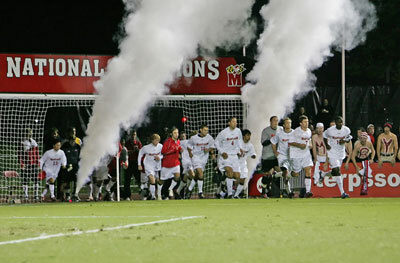 The Terps won the match 3-1 to improve to 2-0-0 on the season. The Terps take on Stanford tonight in the first two weekend matches, as Maryland also plays Radford Sunday night. Maryland head coach Sasho Cirovski is 298-123-29 at the helm in College Park. He needs just two wins to reach 300 victories as the Terps’ head coach. All six of Maryland’s goals have come in the second-half. Maryland has outscored its opponents 6-1. John Stertzer leads the Terps in scoring with three goals. You can listen to the action on WMUC Sports at 7:20. Josh Fendrick and Eric Morrow will be on the call. This entry was posted on September 2, 2011 by Scott Kornberg. It was filed under Maryland Terrapins, Soccer and was tagged with Alex Shinsky, Casey Townsend, Jereme Raley, John Stertzer, Maryland, Maryland soccer, Maryland Terps, Maryland Terps soccer, Maryland Terrapins, Maryland Terrapins soccer, Mountaineers, Mountaineers soccer, Sasho Cirovski, Scott Kornberg, Stanford, Stanford Cardinal, Stanford Cardinal soccer, Stanford soccer, Terps, Terps soccer, Terrapins, Terrapins soccer, West Virgi, West Virginia soccer, Widner Saint Cyr.